The Broncos’ improbable run continues, after their dramatic win last night (sorry to my good friends who are Steelers fans), and so do the stories and comments on Tim Tebow. 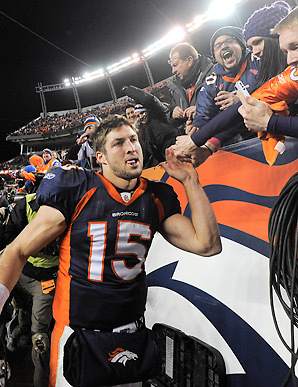 Jon Meacham wrote in this week’s Time magazine about Tebow’s evangelical identity. Check out this comparison of Tebow and Pittsburgh’s Ben Roethlisberger in The Washington Post (HT: Tim Neufeld). And what do you think of this? Tebow threw for exactly 316 yards yesterday! Once again, I think Tebow’s an exciting player to watch and seems like a great guy. But I do think it’s worth critically thinking through the questions he raises about the nature of Christian faith in the public square. Here’s the thought I’m still trying to sort out: What is it about evangelicals and evangelicalism that resonates so strongly with a public figure who has success while maintaining evangelical identity? If you watch Tebow’s post game press conference from yesterday, he “thanks God for providing him with such a great platform.” I immediately thought of you. Is there a consicous attempt in some circles to educate Christians to think this way about their lives? I think the Meacham article in Time touches on that. It does indeed seem that he was raised with that sort of mindset. Perhaps it’s even a mission-focus with him. It seems that he sees his football skills as a gift that he’s supposed to use to reach more and more people with the gospel. That’s also a pretty common way of thinking for evangelicals. Some evangelical colleges teach students to be trained for vocations (teachers, lawyers, etc.) that they’re supposed to use as platforms for gospel work. Being and Irishman living in Canada, I haven’t ever come across teaching that specifically uses the language of “platform.” I have certainly heard teaching that you might label as encouraging that way of thinking but never heard the specific language itself. It’s a very odd American concoction, Andrew. It has lots to do with salesmanship, an American brand of celebrity, and the American culture wars, actually. First of all, I’m not hearing Demaryious Thomas’ name mentioned in all the postgame talk. The wideout had 204 receiving yards and all the talk is centralized upon Tebow. Tebow throws a 15-yard pass over the middle (which all NFL QB’s can make) and Thomas then plants a stiff arm and turns on the burners for the game winning TD. And yet the Steelers got Tebow’ed! Anyways, that’s just a rant. Yeah, there’s a whole team there! And the Denver D is a huge part of it. I have only started watching football in the last couple of years but one of the things that really strikes me about the nfl’s culture is the total focus on the quarterback. When any team wins it is the quarterback which is the reason. As I learn the game I find that 90% of the players I can name are quarterbacks. When I compare this to other team sports I enjoy watching – rugby, soccer, and hockey – the focus on an individual is much more extreme. I suspect this a facet of American society, where there is a much greater focus on the individual making themselves great than on the teams that surround the people. So Bill Gates, Steve Jobs, Warren Buffet, etc. all become business hero’s. This is the Christian world becomes shortened to you make yourself who you are from the raw materials that God gave you – and God must have given you enough raw materials to make yourself great because he loves us and must want the best (riches) for us. One of the things that I like about Tebow is how he doesn’t accept the entire package. He is quite clear that God doesn’t care whether he wins. Listen to him when he is player mic’ed against Chicago asking God for the strength to honour him whether he wins or loses. He also constantly points to other sources of his success on the field by thanking his teammates and his coaches as well as pointing to other aspects of his lives that he thinks are more important than playing football. Tebow is a fascinating story. The most controversial athlete since Muhammad Ali, seems to me. People love him or hate him for a wide range of reasons, some for his unconventional but successful style of play, some for his faith, some for what religiosity symbolizes to them. I resonate with a lot of what Andrew just wrote. My own faith style (Catholic) doesn’t embrace an individual (as opposed to a group) publicly kneeling down after an athletic event. But what do we expect? He’s an evangelical missionary first, and a professional football player second. He’s giving us a lot to debate, which is one of the joys of sports. I agree w/ Andrew and I think anyone who is curious about Tebow should take a look at the video of him mic’d up vs the Bears. This is what brought me over to Tebow fandom and also displays why the QB is so important and what #15 brings to the team and why, in answer to Haddon’s question, he gets credit when Thomas makes the move and the TD. It also shows why Thomas doesn’t mind not getting more spotlight. The Defense has also reported that seeing their QB drop a shoulder for a few more yards instead of sliding pumps them up, too. He’s not just there to handoff or throw a ball, he’s inspiring the whole team to believe they can get it done and that’s why the 4th quarter ‘miracles’ occur – they don’t give up, they play the whole game and good things happen. Why don’t we hear more about Troy Polamalu who is Orthodox and prays between each play including the Sign of the Cross? (He’s a Steeler, btw) Which also brings up the thousands of televised SotC’s by baseball players before each at bat or, for some, each and every pitch. No outrage there? As for why evangelicals make such a big deal about celebrity evangelicals – my best guess is the cultural insecurity which many have, especially those that feel at odds with the culture (fortress fundemantalism). It’s a similar insecurity/pride to that of many Canadians who will know each and every celebrity with Canadian roots and mention it whenever the name comes up – “he’s from Canada, eh?” My brother-in-law, a Canadian and an Evangelical, knows both, and chances are, if that athlete is both Canadian and a “believer” there’s a good chance he actually knows or has at least met him/her!